A Wisconsin man named John Holroyd is the new owner of the La Kiva bar in Terlingua, a decades-old watering hole that’s been popular with generations of tourists and locals alike. Communities in Terlingua and across the Big Bend are still reeling from the tragic death of the bar’s years-long owner Glenn Felts earlier this year. Felts was found dead outside La Kiva the morning of February 4th, from what authorities described as “blunt-force trauma to the head.” A local river guide named Tony Flint was arrested the following day and charged with murder; the bar’s been closed ever since, and its future has been an open question until now. Holroyd, a Biotech Engineer who’s sold everything from kidney dialysis machines to ultrasound equipment for decades now, says he plans to have the bar back open by October 16th, although he admits that’s an optimistic projection at best. Murders are rare in the Big Bend, and the death of Felts has ruffled – and in some cases even divided – members of the community, as both Felts and Flint were popular faces around Terlingua. John Holroyd says he’s a long-time traveler to Terlingua and the Big Bend, and that he’s been a patron of La Kiva since it first opened. We reached him by phone on Wednesday at an Oklahoma truck stop, about 30 miles from Wichita Falls and the state line. He and his wife Josie are currently on their way to Terlingua from Wisconsin to start work on getting the bar back open. Marfa Public Radio: What brings you to this neck of the woods? John Holroyd: Well I’ve been going there since it opened, and as often as I could I used to go down to the desert, walk in the desert, resort to the bar in the evenings, get a good meal, have something to drink, and then go off and walk again the next day. We’ve known this bar since Gil built it, and we were there when Glenn first showed up and was viewed with great suspicion by the locals, and then very quickly became the beloved Glenn and turned the bar into a legend. I couldn’t just stand by and let that legend die. I’ve loved the place, I’ve loved it ever since I first went in there. Will you yourself be living in Terlingua, or will somebody else be taking over management? Initially I will be full time, but I’m going to be taking extended periods where I go off and see my kids and my grandkids. For the first two years, I’m going to be pretty much 100% of the time. There’s a lot to do to bring the bar back to where it needs to be – lot of refurbishing to be done. What are your plans for the refurbishing, or your vision for what the bar’s going to become? What it’s going to become is just like it is right now. It’s an absolutely fabulous place, but remember that Gil built this years ago, and Glenn maintained it, but it hasn’t changed very much, and it’s getting a little bit long in the tooth. The tables need to be stripped and refinished, the kitchen certainly could use an update, and of course it’s been empty for six months now. You can imagine, in six months things degrade. So really, it’s a good clean, some refurbishing, painting, a new kitchen, tidy up the floors and then we should be ready for business. We have to put in a new septic system – that’s a code requirement – but really it’s just going to be a tidy-up job, and we’ll be back in business, and for many people they won’t be able to notice the difference. Did you consider Glenn a friend of yours, having known him for so long? I didn’t know him well. I met him and talked to him on several occasions, but I doubt if he knew my first name. He was always so busy! If he wasn’t hauling barbecue around, he was dealing with his regulars – you know, behind the bar, in the kitchen, setting up music – he was a hard man to pin down at times! So no, I didn’t know Glenn well. I knew enough to know that I liked him, wonderful, wonderful guy and a good host, but beyond that, no. Given La Kiva’s decades-long history and deep ties to the community, there are some who might feel like it won’t ever be the same with Glenn gone. What would you say to those people? I’m not going down there trying to replace Glenn. I couldn’t do that. I’m not Glenn. I would want to keep as much of the bar as it is, with the traditions, unchanged. It’s not my intention to put in a stripper’s pole or turn it into a Chinese restaurant. I love the place for what it is now, not for what it may be, and that’s what I’m going to be trying to preserve. It’s the front room for Terlingua – it’s where people go to meet, hang out, chat with their friends, and that’s what I’m hoping to keep. Of course it would be better if we could have Glenn around, but he isn’t going to be here, and I’ll do my best. 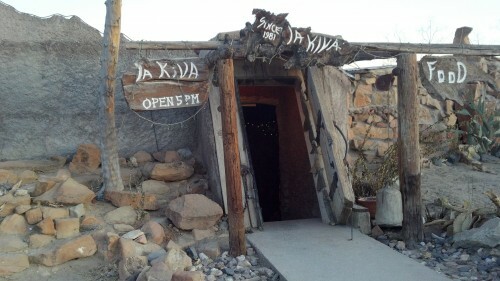 Do you remember the first time you ever walked into La Kiva? Yes I do, very well – it was a stunning experience. We first heard about La Kiva by finding a dollar bill with “La Kiva” stamped in blue letters on it. Then we kept finding these dollar bills, and we had no idea what it was, so we inquired, and somebody said “Oh, it’s a new bar! You ought to go!” So we did! The first impression comes from that front door – holy smoke that is some door – and then you descend into the bowls of the earth, and there’s this warm and friendly, rather strange environment at the bottom of the steps. We were greeted, we had good food, something to drink, and we just kept on going back. It was a stunning experience. This entry was posted in KRTS News and tagged big bend, Big Bend National Park, Crime, Glenn Felts, John Holroyd, La Kiva, Terlingua, Tony Flint, Tourism. Bookmark the permalink.